The players wanted it. The fans wanted it. Nicholas Woods wanted it. The Andover Warriors badly wanted to beat their archrivals at the annual Thanksgiving game. However, the Central Catholic Red Raiders swept away all hopes for a Warriors’ upset with a 44-18 defeat at Veterans’ Memorial Stadium in Lawrence. With temperatures below freezing, the Warriors felt the pain of the loss just a bit more. After a 98-yard drive to start the game, the Warriors were in business and had their sights on a Thanksgiving Upset Special. Unfortunately, the hope didn’t last long. To start the scoring, Will Eikenberry caught a 5-yard touchdown pass from quarterback Oliver Eberth. It seemed as if the Warriors (6-5) were on track to beat their archrival. 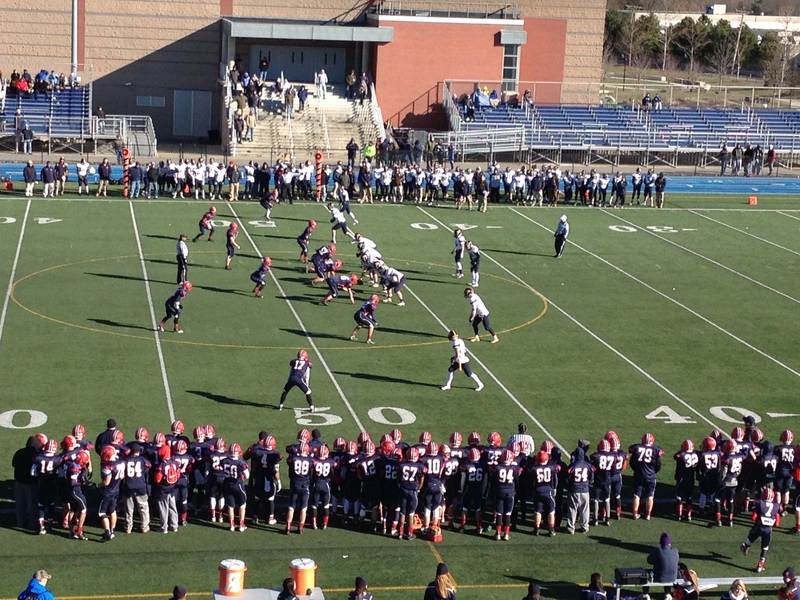 But Andover lost the lead as Central Catholic (10-1) scored on a touchdown pass only a minute later. In the second quarter, with the game 14-6 in favor of the Red Raiders, Eberth threw the ball into the back of the end zone, intending for E.J. Perry, but was intercepted. Soon after, Captain Cody Demers of Central ran the ball 80 yards for a touchdown to give Central a comfortable lead that they wouldn’t relinquish. Andover had its chances. With the score still 21-6 with less than 3 minutes to go in the half, the Warriors had the ball, driving, but failed to capitalize once again. Eberth’s pass fell short of his intended receiver and was intercepted. Central would tack on another field goal before halftime. The score was 24-6 at the break and bunches of freezing cold Andover fans were exiting the stadium. By the start of the third quarter, only one-fourth of the Andover side was still at the game, hoping for a miracle. But it was clear no comeback was possible as the Raiders controlled the line of scrimmage. Eberth and star running back Jack Sylvester were left with no room to run. The Raiders’ defense put the Andover attack to a halt and held the Warriors to just two offensive touchdowns. The Raiders will travel to Gillette Stadium for the MIAA Division I State Championship, also known as the Super Bowl. The Warriors will head home and will be dealing with the departures of Will Eikenberry, Jack Sylvester, and Ryan Payne, to name a few. It was a tough one to swallow for the Warriors, especially on Thanksgiving against their rivals. The Warriors will have to regroup and rebuild, two tasks that will be difficult but achievable if the boys remain focused in the offseason. The loss to Central Catholic on Thanksgiving should motivate the Andover Warriors even more to be one of the top teams in the MVC.